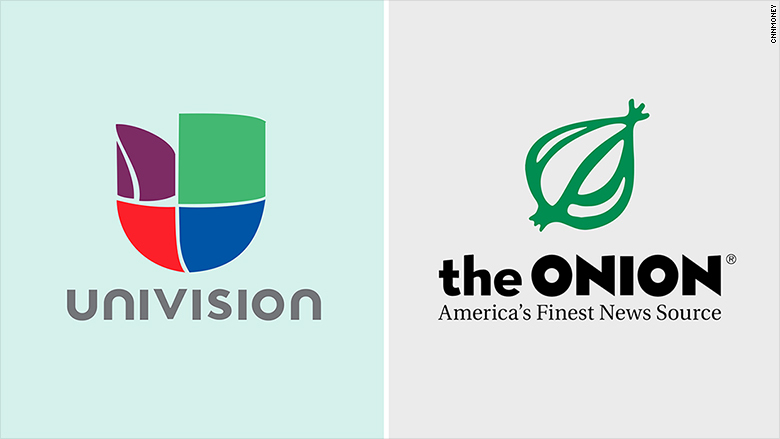 Univision has purchased a minority stake in Onion Inc. -- the company behind the satirical news site The Onion, according to a Univision release. Univision is one of the top Spanish-language media companies with a loyal following among Latinos in the U.S. The investment is an attempt to help the network diversify its content and broaden its appeal to Millennials. "The Onion has been, and continues to be, a leading force of this phenomenon of intellectual, social, cultural and satirical commentary online," the statement said, by way of explaining the investment. Onion Inc. has more than 25 million unique visitors a month, according to the release. The company also produces the pop culture website The A.V. Club and the humorous social media site Clickhole. "Comedy is playing an expanding role in our culture as a vehicle for audiences to explore, debate, and understand the important ideas of our time," said Isaac Lee, Chief News and Digital Officer of Univision and CEO of Fusion, which is also owned by Univision. Onion Inc. will continue to run independently but will be able to take advantage of Univision's resources to increase its digital offerings with more multicultural- and Millennial-focused content. Onion staff members were informed of the partnership in an email from CEO Mike McAvoy. This new investment is just the company's latest attempt to broaden its audience. In 2013, Univision partnered with Disney to launch Fusion, which features 24-hour English-language news and lifestyle programming that's aimed at English-speaking Hispanics in the U.S. In 2015, Univision acquired The Root, a news and culture website geared toward African Americans. The Root was co-founded in 2008 by Harvard professor Henry Louis Gates Jr.
With its investments in both The Root and Onion Inc., Univision has stressed that the smaller companies will maintain their editorial independence while benefiting from Univision's size.